I don’t like clutter in my spaces. Maybe it’s as simple as saying I like for things to be in their place. Each thing, at work or home, has an assigned space; or at least the space I want them to be. 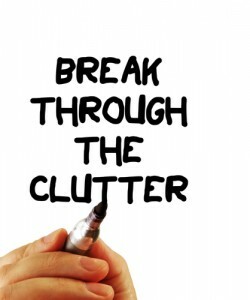 To me, clutter and piles of things laying about in my spaces create a to-do. It’s a to-do I’d rather not do. So my aim is to avoid the clutter from the start. 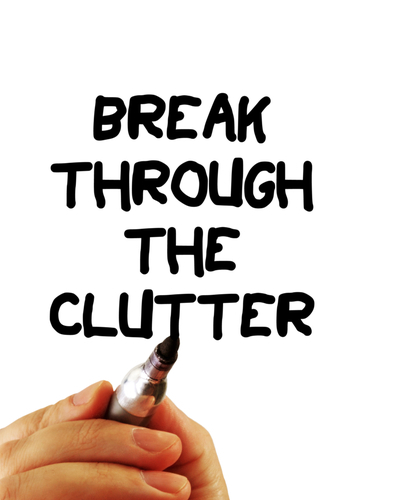 To declutter is as much about routines as any particular tool or method. We have to be intentional in our actions and create habits that minimize clutter from the start. I’m not afraid of throwing away and deleting things which is a key requirement for a decluttered environment. What’s clutter to one person could be perfect balance and harmony to another. I get that. We all have varying definitions and tolerance levels for stuff, things, etc. So it may be easier to frame-up the discussion in terms of a actions and routines. Here are a few of my routines. I’m always looking for more so let me know what tactics you use! I’ve seen co-workers that keep all their email messages in the inbox with no subfolders. They don’t delete messages. The inbox is just one big master list. These co-workers use the built-in email functionality for sorting and searching to manage to their workflow. That works for them, but to me it looks and feels chaotic. Clutter. I use the methodology that after reading an email message it should be immediately filed, deleted, or kept for action. This means that my inbox is really a to-do list. It contains either unread messages or messages that require further follow-up. Saving a document with a modified name to mark version differences is one way show and track changes through the life of a document. I see workers use an editor’s name/initials or even the edit date in the title. This system works for some people because it creates a visual when scanning documents to find various versions. But to me it creates clutter because I see multiple files with similar content in a folder. Typical problems with this method include finding the latest version and consolidating feedback from multiple editors into the final draft. There are many tools available for document group collaboration and versioning. Google Docs, Microsoft SharePoint, Oracle Universal Content Manager are just a few examples. The great thing about a content management system is the document stays in a set location where each group member can edit. This beats passing around updates via email attachments where editors can’t see what other editors have done and can’t be sure they are working on the latest version. It also declutters the inbox! I don’t hear much about a 100% paperless office anymore. The good news is that as society we are definitely reducing the amount of paper we use. Ask the Post Office how that’s working out for them. But printed documents is still a number one source of potential clutter. My first rule of thumb is to avoid printing if at all possible because most documents can be viewed, edited, and stored electronically. There are times when I print for readability, compliance, or portability reasons. But I try not keep paper on top of my desk (physical inbox). As with email, the paper is either filed, recycled (deleted! ), or kept as a to-do. I use organizers like OneNote for filing work documents and keeping a to-do list. I use email to pass links to documents rather than attaching documents when the audience has access to shared storage. I avoid paper when possible and I’m comfortable deleting things when I feel they will have no future use. It’s my version of decluttered life. What’s yours? We’ve all been there. You’re consuming some type of media (blog, book, video, podcast, lecture, etc.) and you’re thinking about how you can apply this new knowledge to your life. In your mind, you can conquer problems, move mountains, improve processes, help others, etc. But then you finish your meal of information and thought all that knowledge is often forgotten and lost. Why does this happen? Do we decide that we’ll never be able to make those improvements? Do we think the ideas are nice to think about but not yet ready for prime time life? It’s nice to think about using a new method for time management, business improvement, or relationship building. But when you finish the material and life happens, then the idea is lost. You move on to the next think crying out for your attention. The biggest contributor to forgetting the information is that we don’t have a system or process for documenting and following-up with the learnings. This information must be captured just like other actionable items. Record the thought in a place that you can access later, or better yet, record the thought in a place that you will access later. Record your thoughts in your ‘to-do’ or task list. You have one of these right? It could be the task tracker in your email program such as Outlook, Thunderbird, Lotus Notes, or Google Mail. Your list should include some type of designator so that you can record your thought as an idea or specific task with a priority. This way, you’ll be reminded of the thought periodically. If the item becomes aged without any progress, as with tasks, you should ask yourself if its really worth doing. Write a review on sites such as Plaxo, Amazon, BookReview.com, or even Facebook. This idea is slightly different because you are recording your thoughts for others to consume. If you use this type of process make sure to list out what you consider to be key learnings or the main ideas for what you are reviewing. Make sure that your reviews are searchable so that when you want to recall a key learning sometime later that you can easily find it. Record your thoughts into a journal, blog entry, electronic notebook, or other organizer such as Microsoft One Note. Think of these tools as a filing system. Tag the content with adequate keywords so that you can retrieve the information later. You may even choose to keep a to-do list in this format. How do you organize your learnings for follow-up and implementation? Do you have a different system than mentioned above?